A Service Dog is a Happy Dog! Did you know that it's quite possible to improve your dog's health and well being with particular training methods? It's true. Correct ongoing training of your dog can result in increased vitality so your dog will actually spend less time sleeping. S/he'll be more alert, but also when your dog sleeps, s/he'll have a really healthy, restful sleep! Dogs enjoy learning new tasks and dogs love training sessions. Can you guess why? That's right - because you're spending time one on one with your dog. And that's what your dog wants most of all! Happiness and mental stimulation are great for your dog's health and well-being! Providing mental stimulation and physical exercise for a dog can help keep them happy and healthy. Dogs have been bred for a variety of purposes over the years and consequently most dogs have the desire to do ‘work’ or complete tasks. Whether this ‘work’ is playing fetch, guarding the house, or digging in the backyard or being trained as a working TMAS Dog, a dog needs a combination or mental and physical activities. Frequently, behavior problems start when a dog is bored, lonely, or lacks enough physical exercise. High energy breeds such as labs or border collies, German shepherds and many other breeds, or mixed breed dogs are particularly susceptible to behavior problems such as barking, chewing or digging if they do not have enough physical or mental stimulation. Without a “job” to do every day, our companion canines can become bored—at the very least. In general, a stimulated dog is a better-behaved dog. If a canine is physically spent, he is much less likely to engage in a variety of problem behaviors. Dogs need to be stimulated, both mentally and physically. Most breeds of dogs were developed to perform specific jobs for people, such as guarding, herding and hunting—work that demands great physical stamina and intense mental concentration. A bored dog is a dog which his mind is not stimulated and is physically not active, this dog will find something to entertain him which will please the dog, but may not please the owner, activates such as tearing up a house when the dog is left all day or barking at passer- by to give him something to do. A dog that has his mind-stimulated dog is a better-behaved dog. TMAS Dogs are educated to provide mobility and physical assistance to individuals with physical or mental disabilities. These dogs enjoy learning new tasks as their doggie smiles on their faces and wagging tails demonstrate. The dogs learn between 60 to 100 commands, or more. To watch a pup learning mental games such as to retrieve items that fall, opening doors, turning light switches on and off, assisting with transactions at stores by placing items on the counter and retrieving objects that have been purchased, etc., is a wonderful experience. The Trainer can see first hand how much the pup or dog enjoys learning new tasks. You can actually watch the pup learning to think and when a task is mastered the dog so enjoys showing off his new skills. Service dogs also provide companionship and unconditional love to their handlers. And the Handler gives their dog unconditional love in return. Dog enjoy being with their Partners as they have opportunity to use their brain to think which enable the Service Dog to perform the task. This keeps the dog’s mind stimulated as well as the body in motion. Another pleasant reality is that a Service Dog is well versed in traveling in many forms of transportation and looks forward to getting out of the house, and enjoys going places and seeing new things with his handler. When a dog is out in public the dog is happy as he is enjoying experience. When the Service Dog is at home and not wearing his jacket, he enjoys many of the same fun things that pet do dogs do such as rolling on the grass, playing ball, and swimming, playing chase with his dog friends playing with new toys, etc. A Service Dogs’ life is a very enjoyable one, which the dog is very happy to participate. A dog that can enjoy the benefits of being with his Human Partner when he/ she goes out, enjoying being part of a team, doing a job that brings the dog happiness, mental stimulation and physical exercise. A dog that has ample opportunity to work, play and relax. The bond that forms between the dog and his handler is one of respect, love, loyalty and dedication. 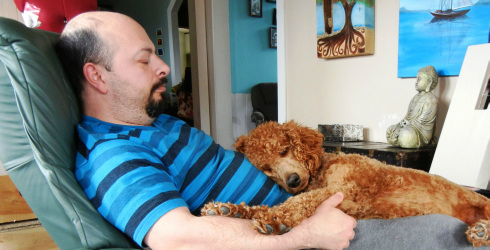 All that makes a very happy partnership for the Service Dog is his Human Partner.